Lately, I've been making everything grilled and spicy, I guess it’s that time of year. I find it ironic that the warmer it is outdoors the spicier the food on the plate. It seems like the closer you are to the Earth’s equator, the hotter the food. This dish is a complete change of pace. 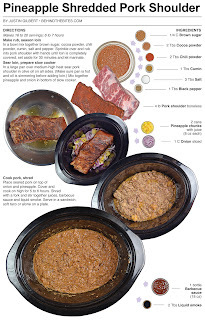 I needed to feed a crowd and the recipe had to be easy – two requisites easily accomplished with a slow cooker. I found pork shoulder on sale at Meijer and thought it was the perfect cut to get between 16 and 20 sandwiches out of. I seasoned it with my basic mole rub that features coca, brown sugar, chili powder and cumin, cook it on a bed of onions and pineapple, then finish it with barbecue sauce and liquid smoke. The end result was tender and juicy pork plentiful enough to satisfy a group of 14 or 15 people. One good thing about this shredded pork is that it can be served in a sandwich or taco, or alone on a plate. Either way - it's Delish! This is the third time I have used this technique to cook a large cut of pork. It’s one of those “if it isn't broke, don’t fix it” kind of things. The rub was the same as before, but each time, I have changed up the vegetables in the crock pot for the meat to roast on. This time I used fruit. 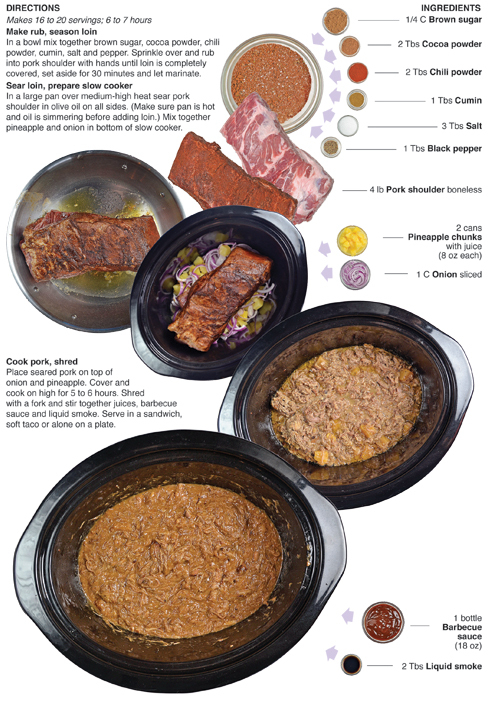 Pineapple works so well with pork that you’d think the two were made for each other. In this dish, the pineapple really disappears. It provided an x factor to this recipe - had I not put it in the dish, it would have tasted totally different. 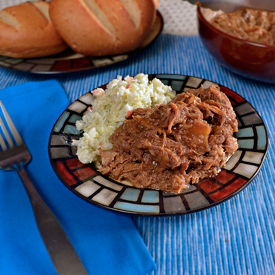 It's the secret weapon of this shredded pork and takes a keen palate to detect. If I had to do it again, I would drain out about half the liquid before shredding the cooked pork, it turned out just fine but I did think there was a little to much moisture. That said, it was still good enough to eat three sandwiches of it myself. In a bowl mix together brown sugar, cocoa powder, chili powder, cumin, salt and pepper. Sprinkle over and rub into pork shoulder with hands until loin is completely covered, set aside for 30 minutes and let marinate. In a large pan over medium-high heat sear pork shoulder in olive oil on all sides. (Make sure pan is hot and oil is simmering before adding loin.) Mix together pineapple and onion in bottom of slow cooker. Place seared pork on top of onion and pineapple. Cover and cook on high for 5 to 6 hours. 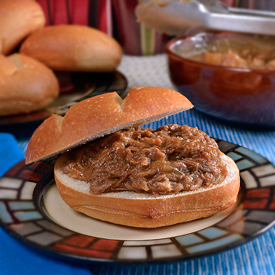 Shred with a fork and stir together juices, barbecue sauce and liquid smoke. Serve in a sandwich, soft taco or alone on a plate.